Partly cloudy skies early then becoming cloudy with periods of rain late. Low 39F. Winds S at 5 to 10 mph. Chance of rain 80%.. Partly cloudy skies early then becoming cloudy with periods of rain late. Low 39F. Winds S at 5 to 10 mph. Chance of rain 80%. QUEENSBURY — A Glens Falls woman who was arrested on drug charges while on probation for a felony conviction for repeatedly driving with a revoked license is headed to prison for 5 years. Cara J. Carlin, 24, pleaded guilty to felony criminal sale of a controlled substance for a July 3 crack cocaine sale in Glens Falls, which occurred while she was on probation for an aggravated unlicensed operation of a motor vehicle conviction. That conviction stemmed from arrests for driving despite the fact her driver's license had been suspended 27 times. Carlin pleaded guilty to the same felony charge in Saratoga County Court for an arrest July 23 in Clifton Park. 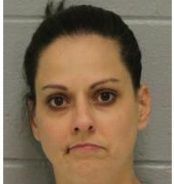 Warren County Judge John Hall sentenced her to 5 years in prison and 3 years on parole in the drug case, and 1-1/3 to 4 years in prison on the aggravated unlicensed operation count. The sentences are to be served concurrently.